Mitch Dengler (Head Observer), Greg Connelly, Hank Cary, Bradley Tinney, Walter Kwong, Sam Wood, Laura Meyer, Stephen Wang, Dan Laurilla, Linda Kudo, Daniel Wong, Paul Klingler, Paderic Driscoll, Jeff Blair, Glenn Ford, Bill Bourret, Brent Zionic, Randall Bugg, Andrew Nguyen, Chris Hazzi, Kate Monforti, Jonathan Monforti, Carl Nelson, Jason Conrad, Geoff Horsfield, Marvin Vuong, Peter Kapostasy, and Abigail Vieregg. Dogs: Must be leashed at Heritage Oak; no dogs at finals stadium! Alcohol is prohibited at Heritage Oak Park. There will be facility employees and event staff checking to make sure people are not drinking. There will also be lots of moms, dads and kids watching the action. Please abide by these rules.If you are caught with alcohol at the park you will risk disqualification for your team as well as potential ramifications outside of the event for breaking the field regulations. 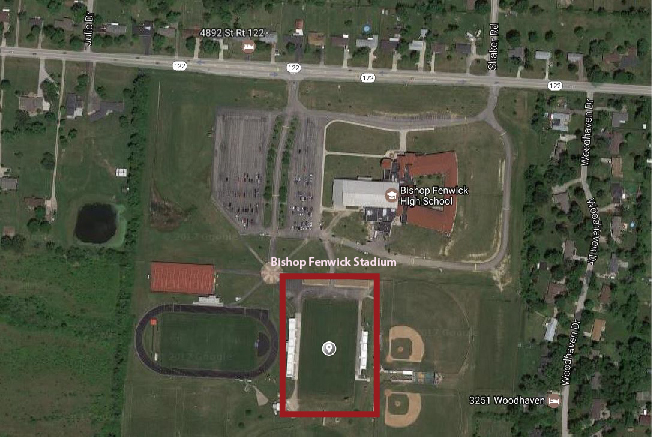 Alcohol will be available for purchase at Bishop Fenwick HS. No Tobacco. USA Ultimate has a no tobacco policy at its championship events. Field Access: Spectators and equipment must stay at least 3 yards away from sidelines and behind any spectator/equipment lines or barriers! Where there are buffer lines, respect them. Where there are not buffer lines, stay back at least 3 yards. Trash and Recycling: Place recyclables in the recycling receptacles, and place trash in the trash. Guests and Spectators: You and your team are responsible for the people on your sidelines and making sure they abide by these site rules. The 2017 USA Ultimate D-I College Championships return to Mason, OH. The 40 top women's and men's teams, 20 in each gender division, will compete for the 2017 titles. Tickets for the 2017 College Championships are now available online. All tickets purchased online will be available at the entrance via will call. Tickets can also be purchased at the event using cash or check only. Children 12 and under are free - please be sure you're only purchasing tickets for ages 13 and up! This event will be held at one location for Friday and Saturday, and another location for Sunday and Monday. Planning to attend the College Championships as a member of the media? Apply for credentials online.